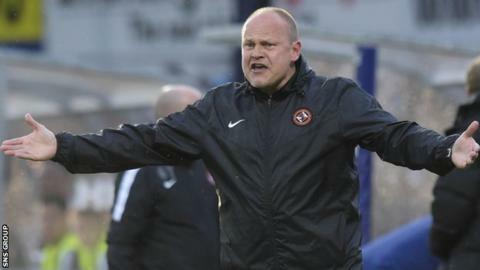 Mixu Paatelainen has left Dundee Utd with immediate effect after discussions over a financial package for his departure were concluded on Wednesday. The Finn met chairman Stephen Thompson on Tuesday following their relegation from the Scottish Premiership. United will now begin the search for a new head coach, with Raith Rovers boss Ray McKinnon an early favourite. "I would like to thank the players, staff and supporters," Paatelainen said after his departure was confirmed. "It has been a difficult winter and the challenge was huge but nevertheless I have enjoyed every day working for the club and with this group of players". Former Finland boss Paatelainen, whose contract ran until the summer of 2018, replaced Jackie McNamara in mid-October with United bottom of the table after just one win in their first 10 Premiership games. But he was unable to inspire an upturn in fortunes, overseeing just five wins in 25 Premiership matches before Monday's 2-1 defeat at city rivals Dundee sealed their relegation fate. United chairman Thompson apologised "unreservedly" to fans on Tuesday, promising "radical changes" in the "near future" to try to ensure a swift return to the top flight. United's next match is at Inverness Caledonian Thistle on Friday. The Tannadice outfit have placed Rovers boss McKinnon at the top of their wanted list to replace Paatelainen. But the Championship club have made it clear they will not welcome an approach for the former Terrors midfielder, at least while the club is involved in the Premiership play-offs. Raith face Hibernian in the first leg of their quarter-final on Wednesday. "And should any be forthcoming it would be extremely unwelcome. Ray and the team are fully concentrated on the play-off matches against Hibernian and nothing will distract them from this."